Stomach and digestive system discomfort is very, very common. It affects one's appetite and ability to sleep well, because the pain attacks when you eat or lie down. When the discomfort recurs very often, it affects your overall health as you cannot eat and cannot sleep. Many people either ignore the pain, or self medicate because they are too busy. It is only when the pain becomes too serious that they see the doctor. The doctors may not correctly diagnose the specific condition because some symptoms are so similar. a) Emotions such as prolonged stress, anger or worries. b) Medications like painkillers. These medications stop the stomach from releasing an enzyme which protect the stomach lining and prevent ulcers. Hence the chance of getting ulcers is higher. If you find the appropriate medicine to take to treat damages caused by ulcers, it takes only 1-2 weeks to heal. c) Not eating breakfast. Our stomach releases acid juice to digest food between 7-9 am. If the stomach is empty at this time, the acid can start to erode the stomach lining. d) Eating at irregular hours such as eating lunch at 3 pm or eating dinner at 9 pm because of work and other commitments. f) Not eating enough resulting in excess unused gastric juice in the stomach. g) H. Pylori bacteria. For such cases, it is helpful to take antibiotics to kill the bacteria. h) Lifestyle habits like lying down after meals to watch TV or to sleep. When one lies down, the acid juice in the stomach starts to back flow up the oesophagus. 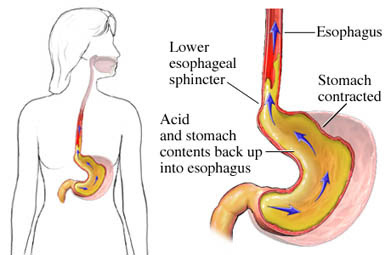 The valve (or sphincter) between the oesophagus and stomach does not have the strong lining protection like the stomach and thus will be easily damaged over time. This is when one would feel pain and discomfort at the area below the chest. If it worsens and the acid flows further up, one feels the symptoms of a heart attack or worse, the very painful burning sensation along the throat. If it's really bad, you will taste a sour or bitter-tasting acid backing up your throat. 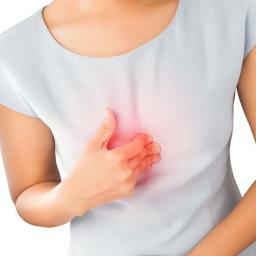 This is acid reflux problem (also called GERD or heartburn). Gastric medication won't be able to repair the valve because it is not in the stomach area. Gastric drugs usually serve the function of diluting the acid juice so it doesn't attack the stomach lining so much thus reducing the pain. However, the weak acid juice negatively affects your digestion and slows it down. Hence you will feel stomach bloating problem and general discomfort after eating. As gastric drugs generally only address the symptoms, such drugs need to be taken for life. It is not an ideal solution. Mix 2 sachets of Jia Hor Soya Protein + 1 sachet Vitaking in 300 ml warm / hot water. Shake well and drink immediately. Take on empty stomach in the morning and night. At the same time, change your habits. Eat more meals but at smaller portions,.Take a slow walk after meals to help with digestion. Do not eat 3 hours before bedtime and do not lie down after food. Manage your emotions. If one suffers from gastric, the relief from the pain is almost immediate after taking the warm protein shake. If it is acid reflux problem, it takes time to repair and heal the valve lining. If the pain is still there after taking Jia Hor Soya Protein, it could be ulcer or something more serious - not just a little injured valve. See the doctor and get a scope done to identify which part is injured. When you are taking medication, it is better to eat the meds together with Jia Hor Soya Protein. Depending on what is the diagnosis, consider taking Lactoberry probiotics and Yung Kien Ganoderma for overall healing of your digestive system. Email askfuiping@gmail.com if you are looking for an effective solution to solve your gastric or acid reflux problem. Click here to refer to Shuang Hor company website for Product Description and Price.